← My new writing project decided – a murder mystery series! Something different – a Book Review! The reason I felt the need to share my review on the following book is partly to promote my current publisher, Hague Publishing. As the book, Frontier Incursion, is another one of their recently published work. I didn’t get it for free, I wasn’t asked to read and review it as part of my contract and freely admit to being slack and not having read any of the other authors I share the publishing house with… yet! Why I chose to read Frontier Incursion, well there are a few reasons. One, I just love the cover! 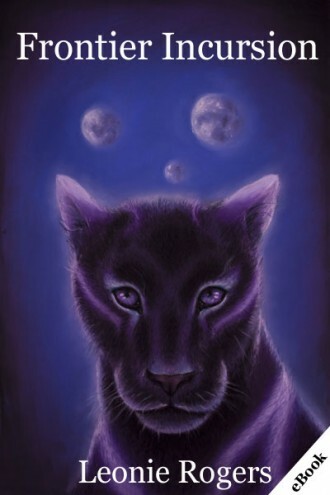 The art itself is by the very talented Emma Llewelyn and really drew me into wanting to know more about these starcats the blurb for the book went on to talk about. Another reason I wanted to read it was because I freely admit to still being a fan of Young Adult fiction… despite being well and truly in the final stages of being a thirty something. It has been a genre I embraced before I was technically a Young Adult and one I have enjoyed all through my life ever since. I am very pleased my eldest child is almost to the age I can use her as an excuse to be in the YA section of my local library without looking like I’ve lost my way from where all the murder mysteries are kept! The third reason was because I got to start talking to the author Leonie Rogers via email and social media and felt I would enjoy anything she wrote so decided to give it a go. Hey, six dollars for an eBook of this length and quality was an amazingly good bargain! And so, without more of my customary waffling, here is my review. It can also be found on Goodreads, of course! Review of Frontier Incursions by Leonie Rogers. For Shanna, joining the Scout Corps had been a dream come true. The Scouts were charged with expanding their knowledge of Frontier, a hostile planet their ancestors had crash landed on 300 years before. As the youngest in her class, Shanna struggles to find acceptance and respect amongst her older peers – a task made more difficult by the fact that she has not just one, but two of the colonists’ huge feline companions, their starcats. On a routine patrol, she and the other cadets are swept up in the greatest challenge yet to be faced by the settlers of Frontier. Now they find themselves on the very frontline of a war they knew nothing about, and possibly the Federation of Race’s last chance against the hostile Garsal. Suddenly their world has changed, and in ways never dreamed of by Shanna and her fellow scouts. This book really was an amazing ‘let yourself go and be absorbed by this world’ sort of book. I rarely come across one I so freely was able to fall into and become a part of so quickly. Yes I grew up in a part of Australia where plants and animals (and even the dirt) was poisonous and or venomous and we had storms with the potential to flatten the city every year, but I don’t think that’s why I clicked with the story so quickly! Although the beginning and its Remembrance Ceremony could have been setting the scene for any of your typical ‘we crash landed’ sort of sci-fi story, you quickly learn to relate to Shanna and her brother Kaiden and their lives with their starcats. As the story progresses the world of Frontier starts as the usual sci-fi survivor camp now settlement type story but then unfurls its tendrils of mystery and danger to show it’s not your typical sort of world. But rather a very dangerous one and these are some very clever people to have survived for so long over the centuries. And done so by accepting the planet and all its dangers and moulding themselves to fit into it all, rather than try and mould it to fit them. I love the scouting parties and the graphical and in-depth views of the world Below in all it’s amazing danger and beauty entwined. It really did keep me wanting to read and wanting to know more. I mean, this book had me up until one thirty in the morning a lot of the time as I’d get to the end of a chapter and my mental mantra of ‘just one more chapter’ would have me winding my way back through the wilderness to see how, when and what would happen when Shanna, Anjo and the Garsal all finally met. The main story followed by the snippet of Garsal activity pegged onto the end of each chapter can truly be blamed for keeping me so riveted and interested to read that one more chapter a night! I highly recommend this book, loved it and actually told Leonie off for having it end the way she did as it just had me grinding my teeth with frustration to know what was going to happen and how dare she leave it hanging like that. All in good humour or course! I am so happy there is a sequel coming out next year and I really look forward to reading it. It takes a very good author to do that to you. I rarely give a five out of five for a book, but this one had me so enraptured for over a week that I now have withdrawal symptoms for having nothing new to learn about Shanna, Twister and Storm. That shows it is a good book and deserves all five stars. Janis, having recently read the manuscript of Frontier Resistence can I say you are going to love the sequel! Unfortunately Leonie was unable to finish the series at two so I am also in the situation of wanting to cry – what happens next! I can also confirm that Emma will be doing the cover for the book. Woo hoo to the sequel, inward groan for having to wait for book three!